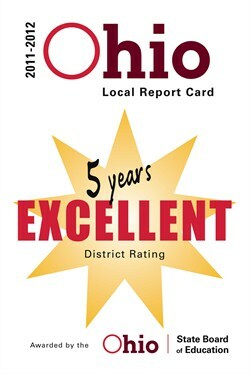 The Ohio Department of Education has released the official 2011-12 Report Card for public school districts in Ohio and as expected the New Richmond Exempted Village School District is rated Excellent for a fifth straight year. Dear Superintendent: On behalf of the State Board of Education and Ohio Department of Education, we congratulate you on your district’s exemplary performance during the 2011-2012 school year. Achieving the ranking of Excellent for five consecutive years on the 2011-2012 Local Report Card is a testament to the hard work and dedication of your teachers, staff, students, parents and community. To recognize and celebrate your outstanding achievement, you are receiving in this message a graphic that you can start using immediately on your website, print materials and other district communications. In March, you will receive a 2’ x 3’ vinyl banner to display in your district. Instructions for ordering additional banners will be included with your banner. We understand that the process to finalize the results for the 2011-2012 school year has delayed celebrating your success and we appreciate your patience. Congratulations again on your achievements, and best wishes for continued success this school year!